Mike Konczal points out today that youth unemployment in the United States is nearly as high as it is in all those Middle Eastern countries where it’s considered a “time bomb” of sorts. “Given this,” he asks, “how could we ever say youth unemployment in the United States’ Lesser Depression isn’t a ‘time-bomb’?” He then posts a chart of the employment-population ratio of 16-24 year olds that “floored” him. As well it should: it’s been on a steep downward trend ever since 1990. But it’s not just young people, though they’ve done worse than older cohorts. Here’s the employment-population ratio for everyone over the past 30 years. The trend for men stayed pretty steady through the 80s and 90s, while women joined the labor force in increasing numbers. Then the bottom fell out. 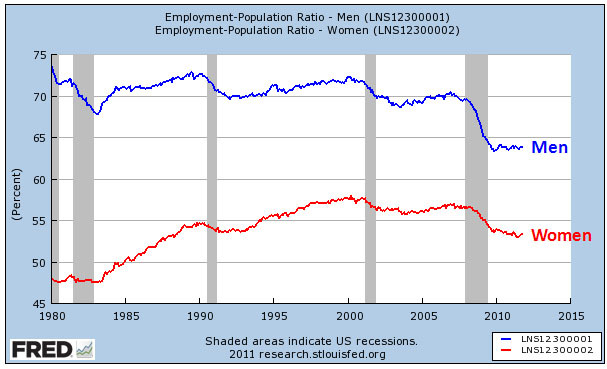 The employment ratio for both sexes fell during the 2001 recession, never recovered during the Bush era, and then plummeted again in 2008. The Great Recession has made all of this far more visible, but the problem didn’t really start in 2008. It started in 2000. The U.S labor market has been stagnant for over a decade now.